We planted our summer squash. 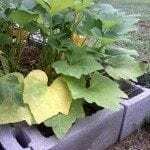 It has beautiful leaves and had blossoms also, but the squash did not get even medium size. It was terribly small and very dark yellow with few squash on it. What is wrong? We did have two episodes of flooding to 12 inches, twice within weeks of one another. Could this cause that? The stunted fruit could be caused by poor pollination, which can oftentimes be attributed to rain.